To Grandmother’s House You Go! Are You Ready For Winter Driving? Make your own or purchase a pre-made car weather safety kit. This kit should include: first-aid kit, jumper (booster) cables, tow ropes, cat litter (or something to gain traction under your tires if stuck somewhere slippery), a windshield scraper, candle, and matches. Check your tires well before the winter season begins. Be sure the tread on your tires is good enough to last throughout the entire season. Install chains on the tires if necessary. Blankets and warm clothing. If you are stuck in your car – you need to stay warm. Get blankets or sleeping bags such as a space blanket and place them in the trunk of your car. Pack water and snacks. Keeping warm is important, but so is staying hydrated and maintaining your energy. Keep water and snacks inside the car or in the passenger compartment, as they might freeze in the trunk. Try to avoid traveling alone – especially in unfamiliar places. The months between November and April can be one of the busiest road trip seasons. 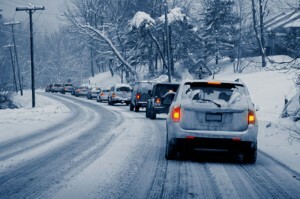 America’s highways are jammed even when temperatures plunge and driving conditions can be challenging. If you find yourself hitting the road during adverse conditions, remember to get your car ready so that you have a safe and comfortable drive wherever the road takes you.